Basket weaving traditions originate from last century when handcrafting during winter was very popular among peasants and older people. However it is still popular in many regions in Estonia. “Kallekorvid” got its name from Kalle, who has gained experience from his grandmother back in the 1970-s while earning some pocket money. Back then they were making mostly traditional berry and mushroom baskets. As the time has passed many new opportunities have emerged for veneer and plywood usage. We have created new product groups such as laundry baskets, storage chests, boxes for the toys, firewood baskets, dustbins, wall envelopes, cradles, different trays, boxes, small noggins, baskets for spices, picnic baskets, baskets with handles, bread baskets, armchairs, different lamps and panels for interior design. All new ideas are welcome, because it helps to grow our crafting skill and improve product design. Chip- and plywood baskets are handcrafted from high-quality birchwood. Some products have handles, which are made from linen strap, cord or leather. Leather parts are residues from factories, which guarantees effective usage of materials and environmental sustainability. Our baskets are inspired by Scandinavian design features such as simplicity, minimalism and practicality. Our baskets are made from the finest materials and crafted with skill. All products are multifunctional and storage different kinds of items. The baskets are not burdened with excessive details that makes them easy to fit into various interiors. To create quality home decor products, which we highly value and use. We save nature by using only environmental-friendly materials. 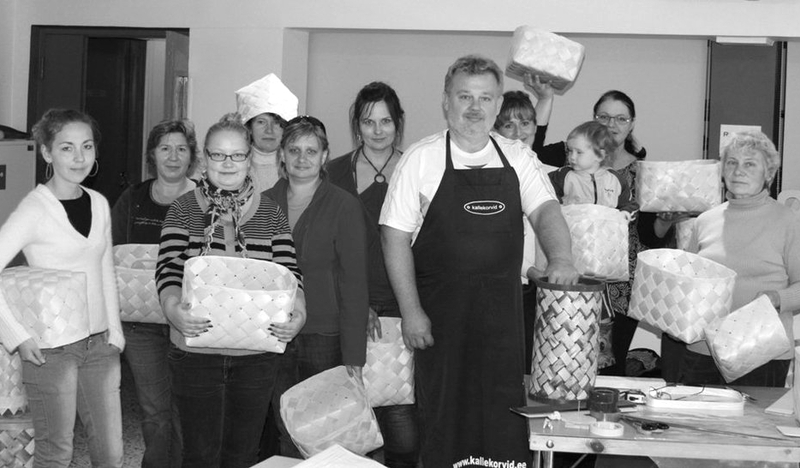 Esthands OÜ is family business, including Kalle – founder of the company, his son, wife and few experienced craftsman. Our baskets can be found in many homes in Estonia, Scandinavia and Japan. As a small and flexible company, we can make special orders according to customer’s request.